This is a copy of a paper in the Social Problems Theory Division Newsletter, Spring 1999. Please cite as: Deflem, Mathieu. 1999. 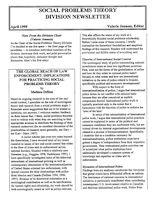 “The Global Reach of Law Enforcement: Implications for Practicing Social Problems Theory.” Social Problems Theory Division Newsletter (April 1999):1-3. Based on ongoing research in the area of law and social control, I speculate on the role of sociological theory and research from a social problems angle. I formulate some suggestions that are to be treated as questions, not answers. I welcome readers feedback on these issues that, I think, social problems theorists need to reckon with when they are searching to find appropriate avenues to distribute the findings of their research endeavors (for an excellent discussion of the practicalities of research more generally, see Gary, not Karl, Marx 1997). A junior scholar just over two years beyond the dissertation, I have devoted most of my recent research to issues of law and social control that relate to the flow of crime and its enforcement across national borders. 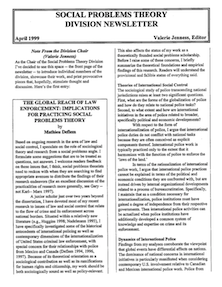 Situated within a relatively new literature (e.g., Huggins 1998; Nadelmann 1993), I have specifically investigated some of the historical antecedents of international policing as well as contemporary dimensions of the inter-nationalization of United States criminal law enforcement, with special concern for their relationships with police from Mexico and Canada (Deflem 1994, 1996, 1997). Because of its theoretical orientation as a sociological contribution as well as its ramifications for human rights and citizenship, my work should be both sociologically sound as well as policy-relevant. This also affects the status of my work as a theoretically founded social problems scholarship. Before I raise some of these concerns, I briefly summarize the theoretical foundations and empirical findings of this research. Readers will understand the provisional and fallible status of everything said. The sociological study of police transcending national jurisdictions raises at least two significant questions. First, what are the forms of the globalization of police and how do they relate to national police tasks? Second, to what extent and how are international initiatives in the area of police related to broader, specifically political and economic developments? In terms of the rationalization of international police work, I argue that international police practices cannot be explained in terms of the political and economic conditions they are confronted with, but are instead driven by internal organizational developments related to a process of bureaucratization. Specifically, I maintain that as a condition necessary for internationalization, police institutions must have gained a degree of independence from their respective governments. Then international police activities can be actualized when police institutions have additionally developed a common system of knowledge and expertise on crime and its enforcement. Findings from my analyses corroborate the viewpoint that global events have differential effects on nations. The dominance of national concerns in international initiatives is particularly manifested when considering contemporary U.S. involvement relative to Canadian and Mexican international police work. Police from Canada and especially from Mexico are in a secondary role and largely dependent on their counterparts in the United States. With respect to the rationalization of international policing, data show that while political conditions influence the degree of police independence, they cannot account for the dynamics of international police work. Among the important implications is that cooperation can take place between police of national states that may be very different in political, legal and other respects. Furthermore, independence can imply that police activities operate without sufficient political (congressional) oversight and legislative control. In fact, the motivational basis that operationalizes international police work is provided by a professional expertise to control international crime, predominantly guided by standards of efficiency. In terms of future concerns, I speculate that unilaterally instituted international police work will remain by far the most dominant form. This pertains particularly to the "Americanization" of, and U.S. dominance in, international police initiatives, especially relative to its neighbors in Canada and Mexico. Second, a consequence of the fact that police agencies operate largely independently from the political context of states is the potential for police to emphasize an efficiency of crime control without sufficient regard for issues of law and justice, especially human rights. International police activities are often found to be planned and executed as efficient responses that are conceived to be technologically sophisticated, but that fall short in terms of requirements of due process. The literature on international policing is steadily growing and I warmly recommend readers to get acquainted with this critical body of scholarship (see, e.g., Huggins 1998 on police training in South America; Nadelmann 1993 on the Americanization of drug enforcement; Dunn 1996 on U.S.-Mexican border control; and Holmes 1998 and Martinez 1994 on border violence). Just as strongly, of course, I encourage sociologists of social control to appeal to the dual audiences of sociological academe and criminal policy. This brings up a first speculation. 1. Social problems theorists will be more effective when they develop participatory strategies of scholarship. I obviously refer to the uncanny calls, all too popular these days, to debunk every single aspect of available, traditional work and to ‘broaden’ the standards of scholarship. Some of the criticisms uttered alongside of this disadvice are relatively sound, but I have personally found the forwarded solutions often to be as ill-conceived as they are apologetic. The point is not to chastise the leading journals (and scholarly institutions), but to invade them, and by invading them to change them. This strategy leads to a second musing. 2. Social problems theory and research can benefit from an analytical separation between theoretically guided empiricism and normatively oriented critique. Thus, for instance, while my research brings out critical insights on human rights --issues the significance of which social problems theorists readily understand-- the theoretical approach is resolutely Durkheimian and thematically indebted to Weberian theses, perspectives that are typically not seen as social problems oriented. But there is a critical attitude, I believe, already in soberly undertaking empirical analyses (see also Deflem 1998), and this attitude is extended if analysis leads the way to also but distinctly bring up implications of a more critical, moral orientation. Conversely, critique on the basis of poor or no data will not be heard except by the believers. This introduces a final thought. 3. Theoretically informed social problems research should be distributed in various formats that are oriented at different audiences. Irrespective of the ‘whose side are we on?’ question, there is an important ‘how to get it across’ aspect involved in social problems work. Those of us who are academics have and must remain an interest in communicating to fellow researchers and students through the established channels of communication in publishing, conferencing, and teaching. But I believe it wise to expand (not substitute) scholarly productivity with efforts at out-reach to audiences other than one’s primary reference group, be it social movements, rights groups, or, perhaps less ambitious, applied scholars and fellow SSSP’ers with substantive interests other than mine. Deflem, Mathieu. 1994. "Law Enforcement in British Colonial Africa." Police Studies 17:45-68. ____. 1996. "Borders of Police Force: Historical Foundations of International Policing Between Germany and the United States." PhD dissertation, Department of Sociology, University of Colorado. See related book. ____. 1997. "Policing International Society: Views from the United States." Police Forum 7(3):6-8. ____. 1998. "The Boundaries of Abortion Law." Social Forces 76(3):775-818. Dunn, Timothy J. 1996. The Militarization of the U.S.-Mexico Border, 1978-1992. Austin, TX: CMAS Books. Holmes, M.D. 1998. "Perceptions of Abusive Police Practices in a U.S.-Mexico Border Community." Social Science Journal 35:107-118. Huggins, Martha K. 1998. Political Policing: The United States and Latin America. Durham, NC: Duke University Press. Martinez, Roberto L. 1994. "NAFTA’s Effect on Human Rights at the Border. "University of California Davis Law Review 27:979-985. Marx, Gary T. 1997. "Of Methods and Manners for Aspiring Sociologists: 37 Moral Imperatives." American Sociologist 28(1):102. Nadelmann, Ethan. 1993. Cops Across Borders: The Internationalization of U.S. Criminal Law Enforcement. University Park, PA: Pennsylvania State University Press. See related papers on sociological theory.